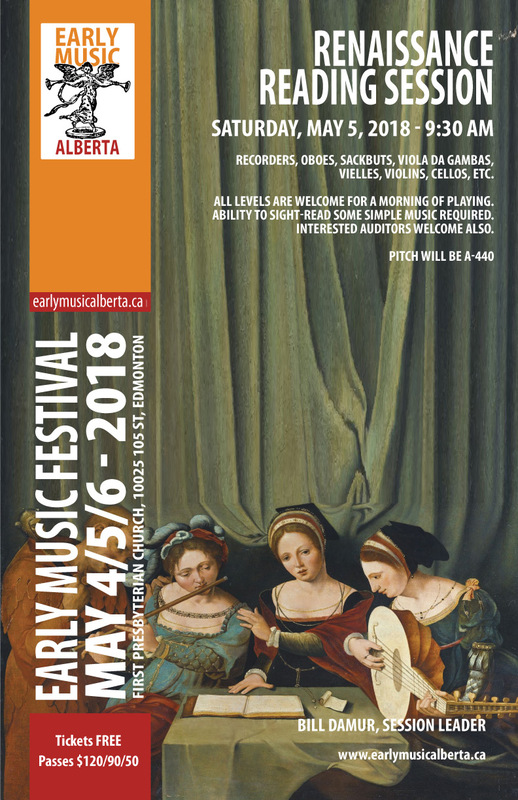 Early Music Alberta is excited for its Early Music Festival May 4 to 6 2018! 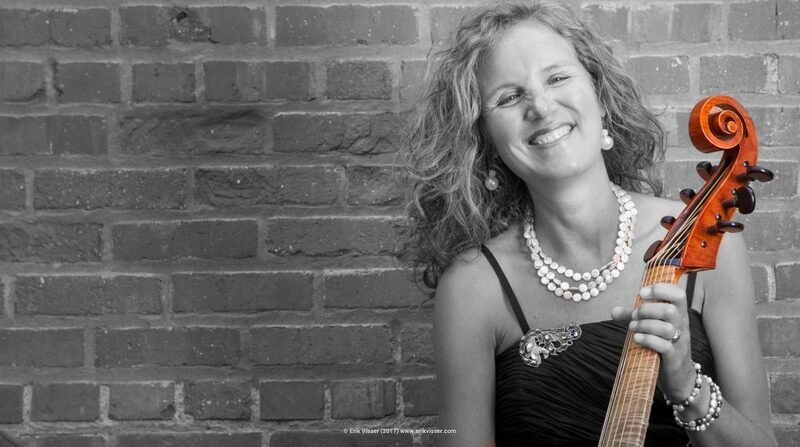 We have a spectacular line-up of events with concerts, masterclasses, workshops and more! 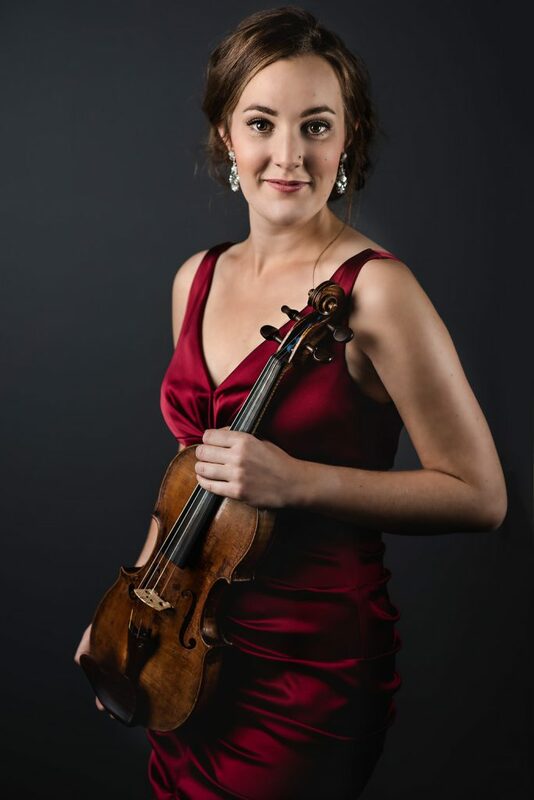 This year’s’ concerts will feature an impressive lineup of local musicians as well as our international guest Mathilde van Wijnen from the Netherlands on basse de violon. You can purchase individual tickets and festival passes below. 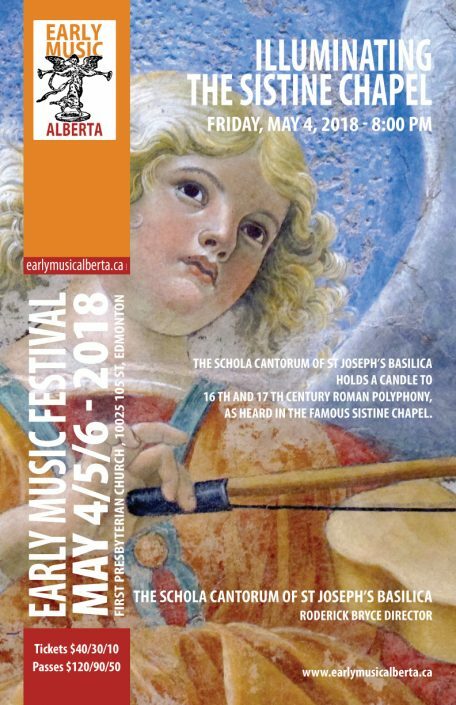 The Schola Cantorum of St Joseph’s Basilica holds a candle to 16th and 17th century Roman polyphony, as heard in the famous Sistine Chapel. Beginning with the sombre atmosphere of Holy Week, as the darkness overwhelms the stirring lamentations of Tenebrae, we culminate in the haunting beauty of Allegri’s Miserere. And then we explore brighter festal works associated with the feast of Candlemas, when the Christ-child is presented as the Light of the world, with rousing works by and lesser-known composers of the papal court. All levels are welcome for a morning of playing. Ability to sight read some simple music required. Interested auditors welcome also. 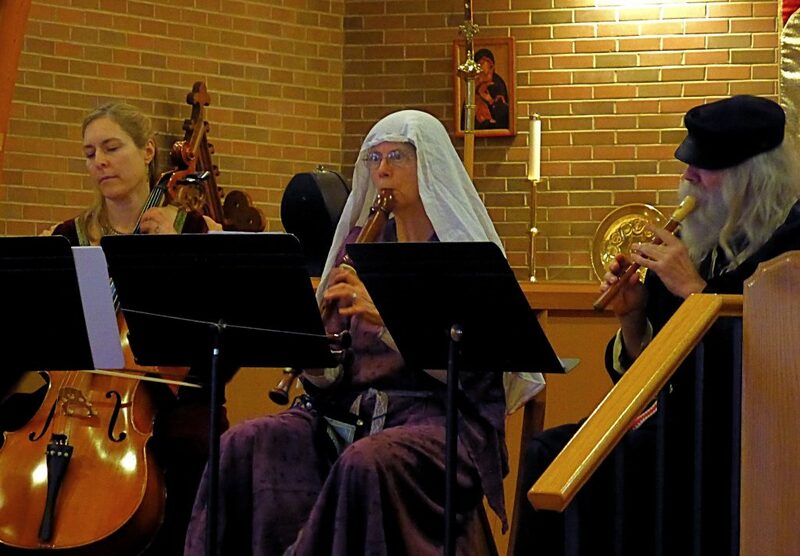 Much secular Renaissance music has associated dances and songs. 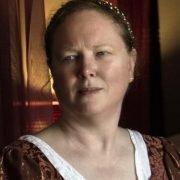 In this two-hour workshop participants will learn several period dances including bransles, pavans and almans from Italian, French and English traditions. The class will conclude with dancing to live music performed by the Borealis consort and guests. No prior dance experience is required, however comfortable shoes are a must. Class size is limited to 24 people. 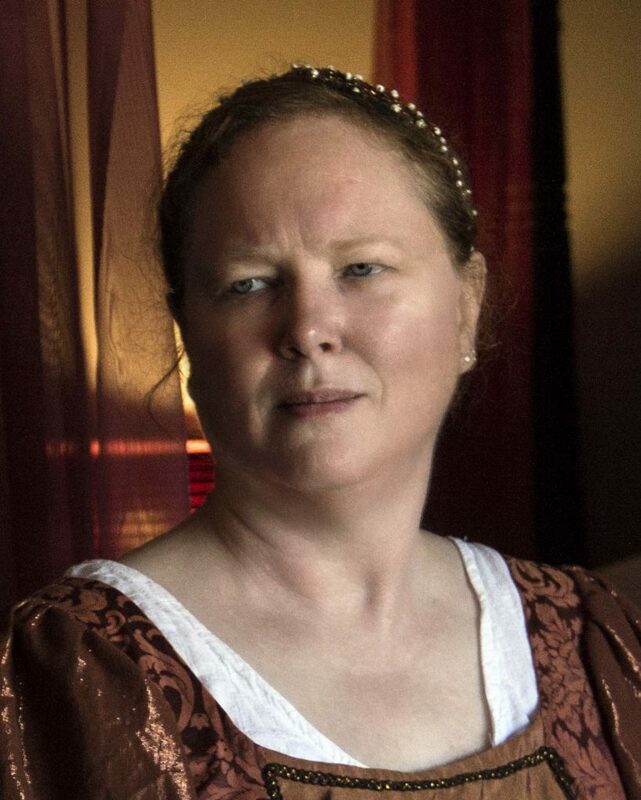 Dance Mistress Cath Jackel has taught Renaissance dance for more than 25 years. 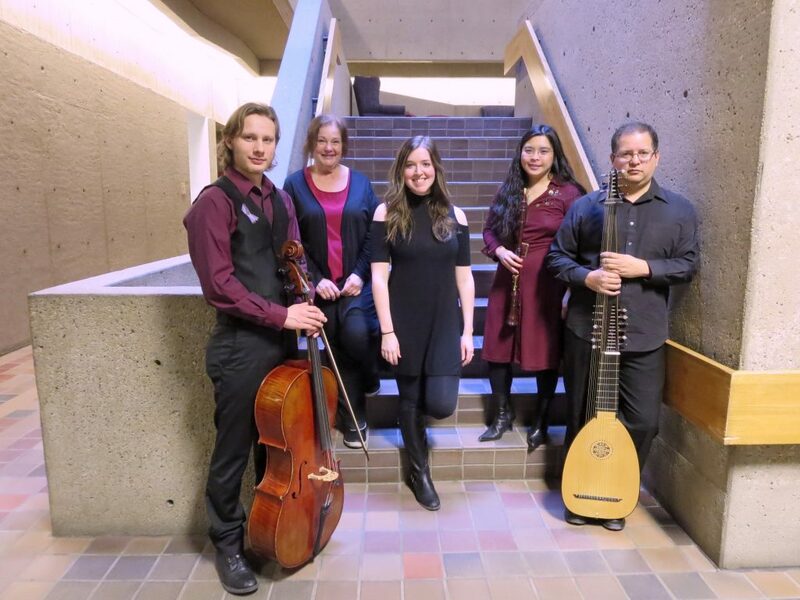 The Borealis Consort is a group of Edmonton musicians with a particular interest in renaissance dance music. La Folia is a string ensemble dedicated to the historically informed performance of early music. Their repertoire includes many works by little known composers from the renaissance and baroque eras. 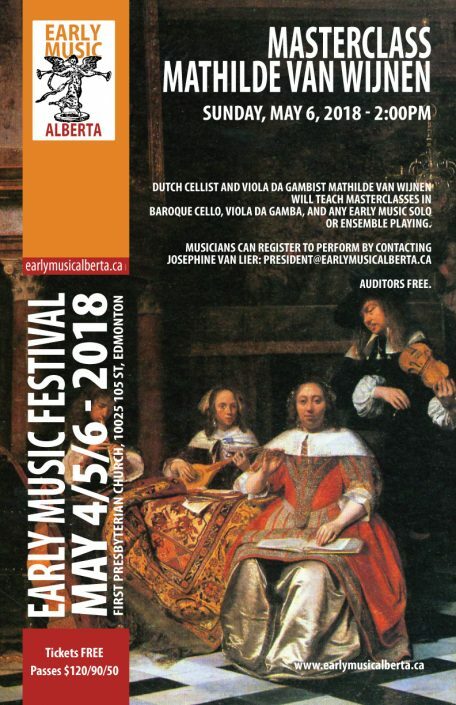 Much of the music they play has never been published and they regularly play from often difficult to read manuscripts and learning to play the many different clefs used in the period. 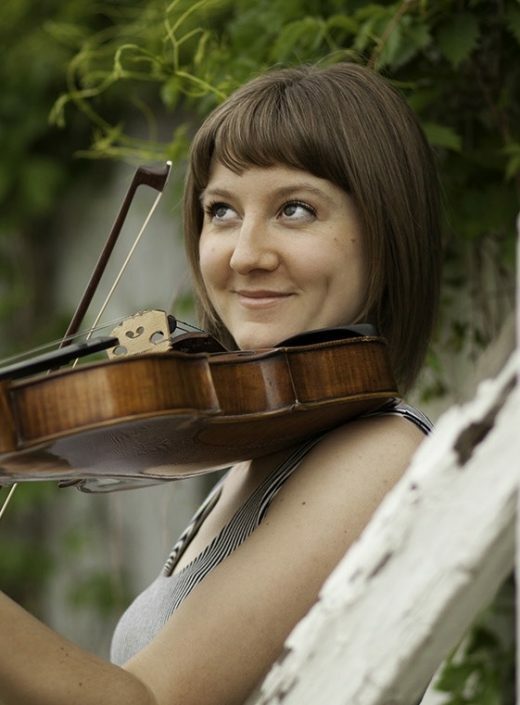 Most of the musicians play on (copies of) period instruments and bows and use historic strings. 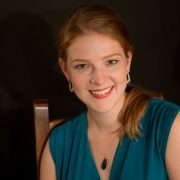 The ensemble rehearses weekly on Tuesday evenings and has a minimum of three performances per season. In addition, La Folia has accompanied choirs wishing to work with a period string ensemble for their performances. 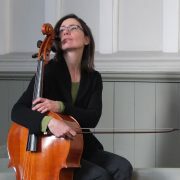 La Folia was founded in 2012. Bella Baroque is an ensemble of musicians playing historically informed works of the Baroque era 1600 – 1750. They often perform in period costume. 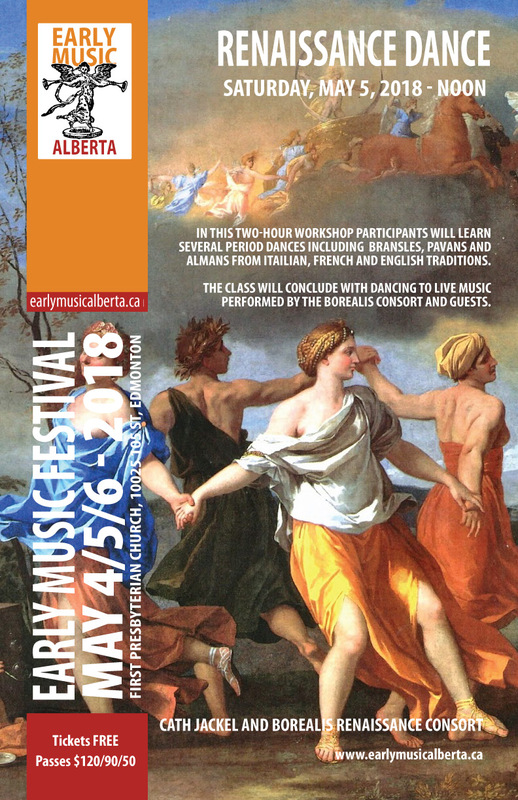 The impetus for this group is to recreate what was the “Collegium Musicum”, an early music ensemble that used to be at the University of Alberta. 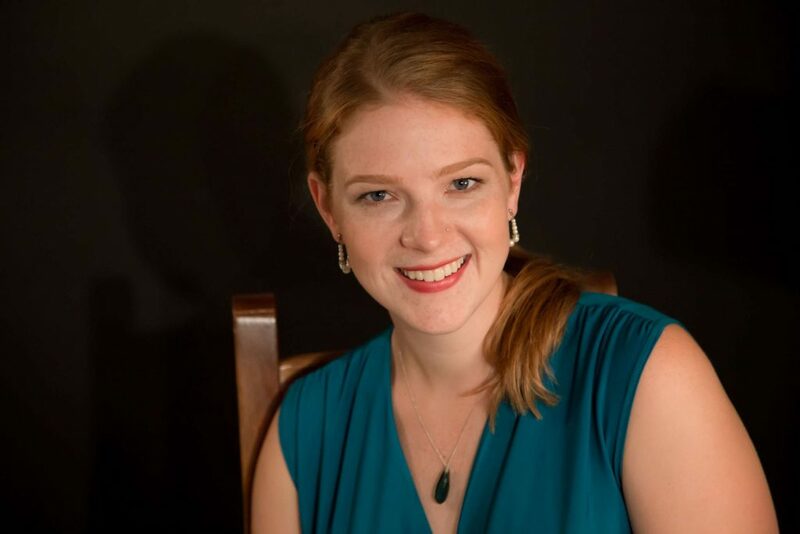 Created by lutenist and music student Renée Pérez, this new ensemble would like to establish an enduring period performance legacy at the university, covering music from the medieval, renaissance and baroque eras. Here, we present music from the Renaissance, on instruments that we hope provide a glimpse into what these pieces would have sounded like back then. 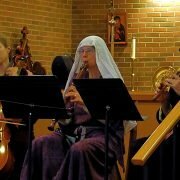 Music from late 16th century Germany including Bach, Buxtehude, Biber, Reincken. According to baroque theorists and writers, the Stylus Phantasticus is the freest musical style of the baroque. 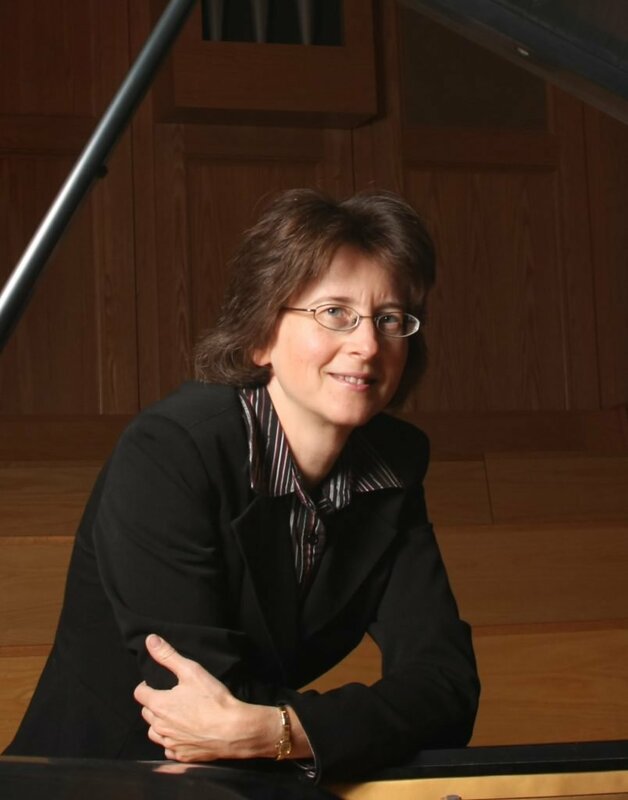 Since its origins in Italy in the late 16th century, to its latest evolution phase at the North German organ school of Dietrich Buxtehude; the Stylus Phantasticus was present in the music of the baroque period. It is a category to describe works which could not be explained within the norms of more clearly defined structures. As an explanation of these artistic phenomena, its early use was concerned with the ‘fantasy’ or imagination of the composer and his composition while later theorists expanded the term to articulate the freedom of creativity and improvisation which they considered to exemplify good performance. “Stylus Phantasticus wants to keep the listener awake by special effects, astonishment, irregular voice leadings, dissonances, variations in rhythm and imitation. It is a free, improvisational style which forces the audience to listen full of astonishment while wondering ‘how is this possible?’ ”(Ton Koopman 1991). Some of Alberta’s finest period performers will be joined by Mathilde van Wijnen from the Netherlands on basse de violon to perform spectacular works by Stylus Phantasticus composers. 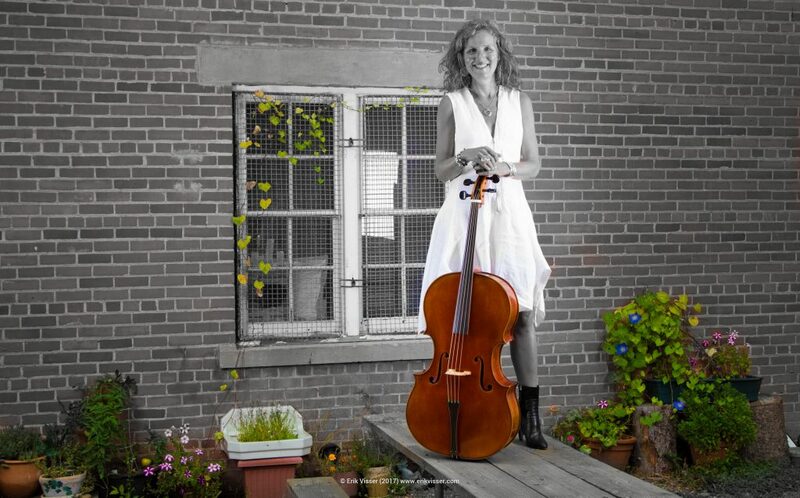 Dutch cellist and viola da gambist Mathilde van Wijnen will teach masterclasses in baroque cello, viola da gamba, and any early music solo or ensemble playing. Music for two cellos, cello and bassoon, cello and bass and a combination of all four! 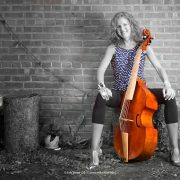 A baroque cello, a basse de violon, a baroque bassoon and a baroque bass will take to the stage for an unforgettable evening of music featuring some very virtuoso and heartbreakingly beautiful music for several combinations of all of these instruments. 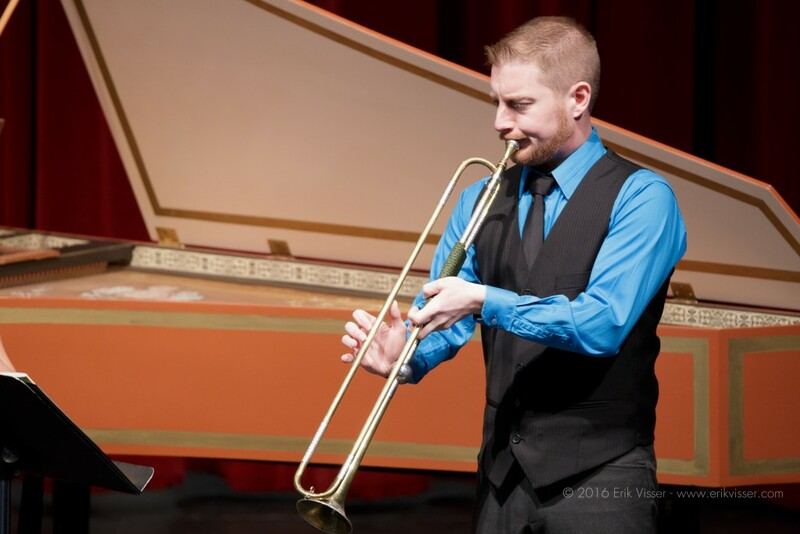 If you ever thought these instruments were having a bass-function-only in the baroque era; you will be in for a pleasant surprise! 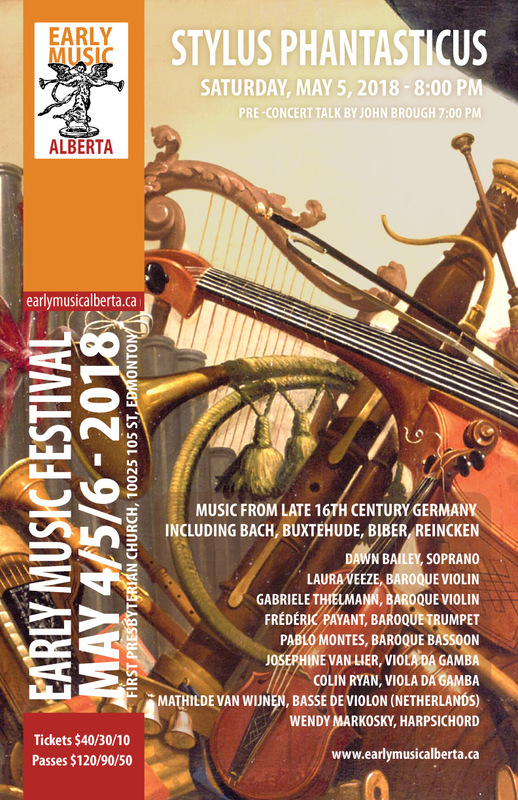 You will be taken on a journey through Italy and France in the 17th and 18th centuries with music that you will still be whistling on your drive home! 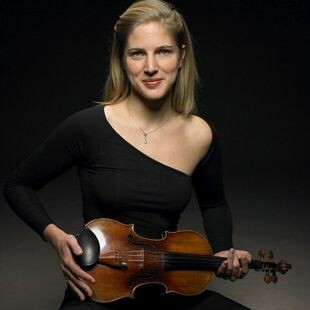 Local superstars will be joined by our friend Mathilde van Wijnen from the Netherlands on basse de violon. Of Gods, Myths, and Musicians! Tickets are $40, $30 for seniors and members. 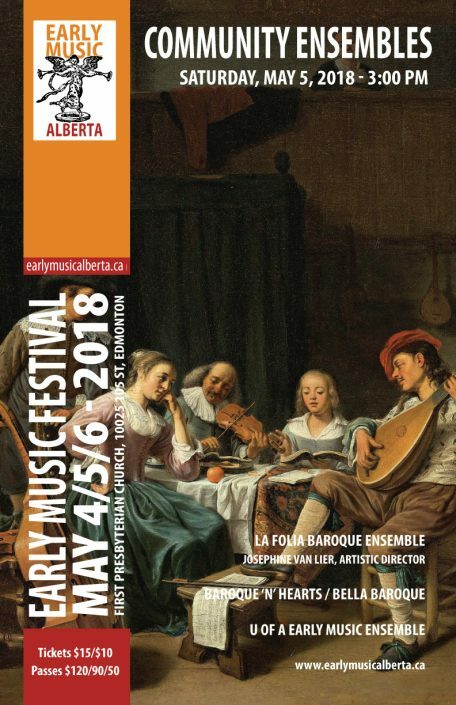 Paul Luchkow and Michael Jarvis, two of Canada’s leading early music performers, will make a rare Edmonton appearance performing a programme of virtuoso chamber music from the Baroque period for baroque violin and harpsichord. Music by Handel, Telemann, Couperin, Biber, and highlights from their newest CD of Mythological Sonatas, op. 25 by Michel Corrette will be featured. 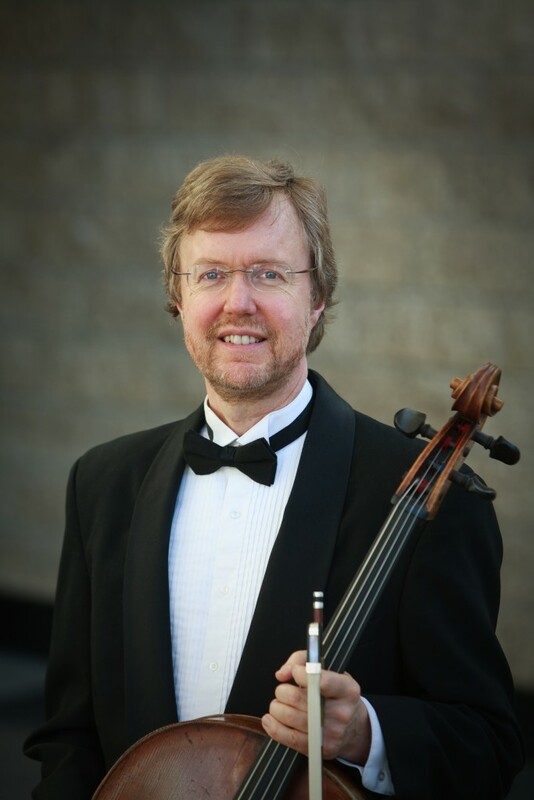 Paul Luchkow is a versatile violinist and violist whose activities cover the range of music from the 17th Century to the present day on modern and period instruments. 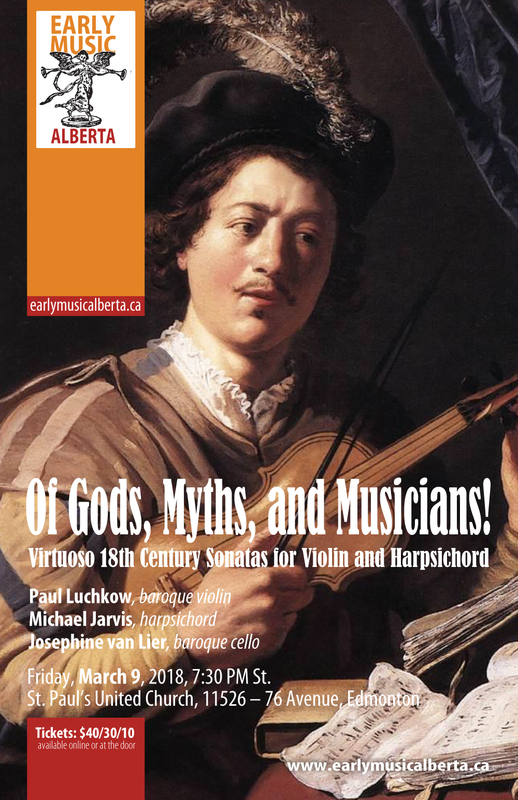 In addition to the Victoria Baroque Players, he is a regular feature of Vancouver’s Early Music scene. 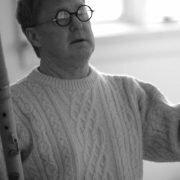 Paul is a long-time member of the Pacific Baroque Orchestra and appears frequently in concerts for Early Music Vancouver, the Early Music Society of the Islands, as well as at Victoria’s Pacific Baroque Festival. 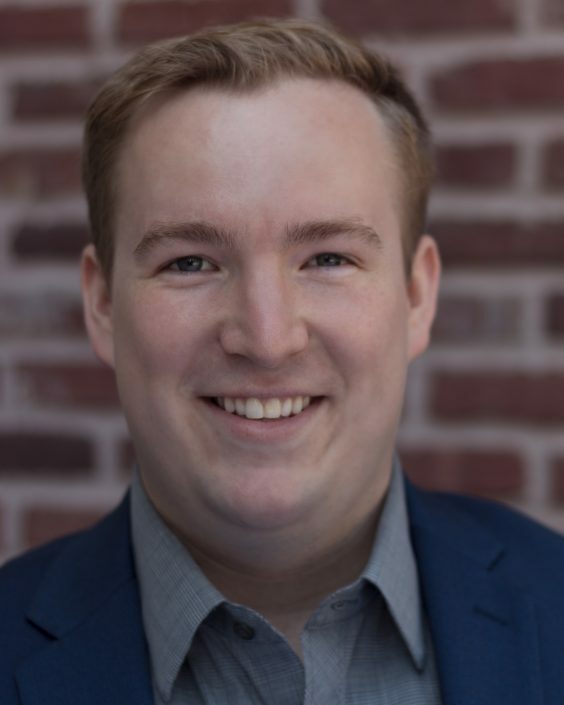 In demand as a leader, guest director, and educator, Paul has worked with Per Sonatori: Regina’s Baroque period-instrument ensemble, VoiceScapes and Spiritus Chamber Choir in Calgary, and he has given performances and masterclasses at universities across western Canada. 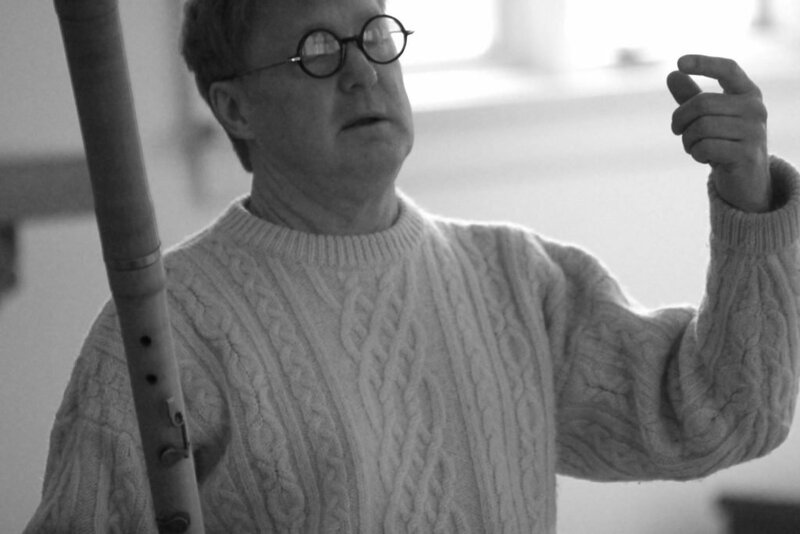 As an adjudicator, Paul frequently hears and encourages young musicians across British Columbia. A highlight of recent years has been his work with fortepianist Michael Jarvis and their exploration of Baroque, Classical and Romantic sonata repertoire on period instruments. 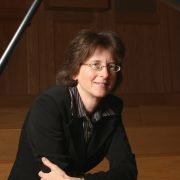 They have two recordings: Hummel Sonatas (nominated for a Western Canada Music Award) for fortepiano and violin / viola, and Sonatas, op. 25 on Mythological Subjects by the French composer Michel Corrette, which was just released on Canada’s prestigious Marquis Classics label in September 2017. 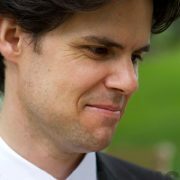 Paul makes his home in Victoria, BC, Canada with his wife and children. 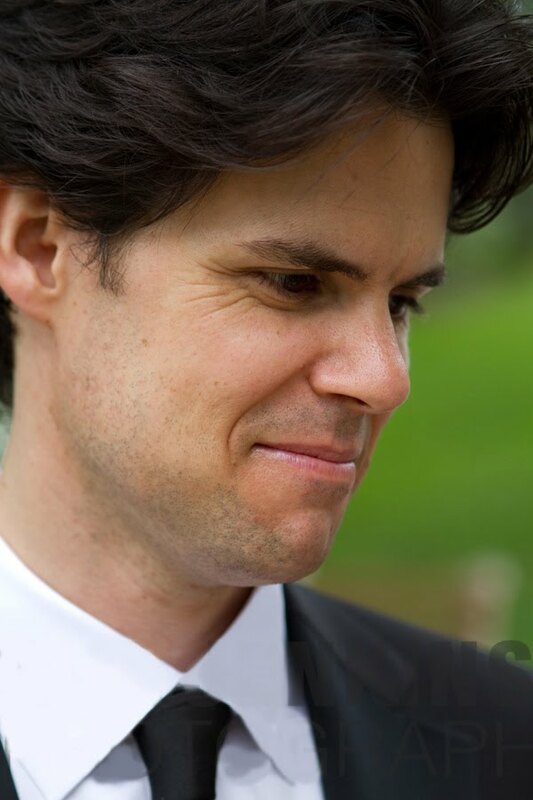 Michael Jarvis is one of Canada’s finest harpsichordists, fortepianists and continuo players, and is in demand as a coach and collaborative artist. 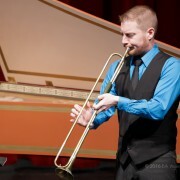 A frequent performer throughout Canada, he has also performed with many of Canada’s leading orchestras and chamber ensembles (from New York City’s Carnegie Hall to the Walt Disney Concert Hall in LA), accompanied, conducted, or played continuo for many of Canada’s finest singers and has appeared as soloist or continuo player at many festivals throughout North America. 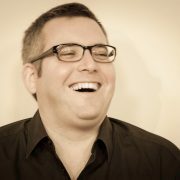 He may be heard on the Marquis Classics, Hungaroton, ATMA, Naxos, Solitudes and Avalon CD labels, and has many times broadcast nationally and regionally for the C.B.C., as well as nationally across the U.S. on N.P.R. 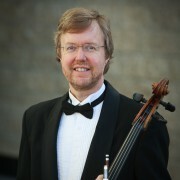 His and violinist Paul Luchkow’s CD of Hummel’s op. 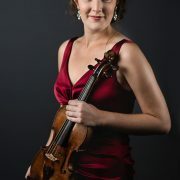 5 violin sonatas was chosen as a finalist as best classical album of the year in the Western Canadian Music Awards 2013. His new CD with Paul, Michel Corrette’s Sonatas for Harpsichord and Violin, Op. 25 (on mythological themes) was released on Canada’s renowned Marquis CD label in September 2017. Michael was featured on two national Canadian television specials for Bravo: “A Baroque Christmas” and “A Baroque Easter”. 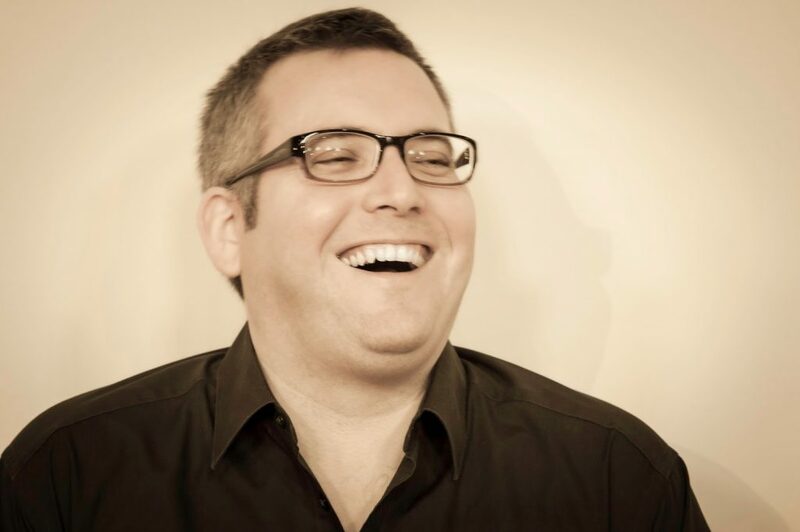 He was also co-host and star of the 13-part television series “Come into the Parlour” for Bravo-tv. 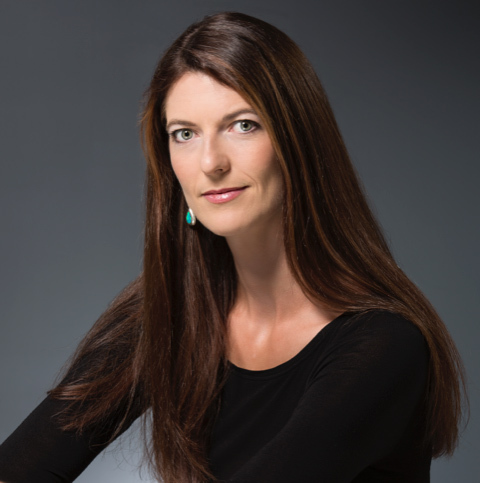 He also conducted in Toronto the world premiere of the chamber opera “Cassandra” by Vancouver composer Ian McAndrew, to glowing reviews in Opera Canada. His performing editions of 17th and 18th century choral and organ music have been published by GIA, Chicago. 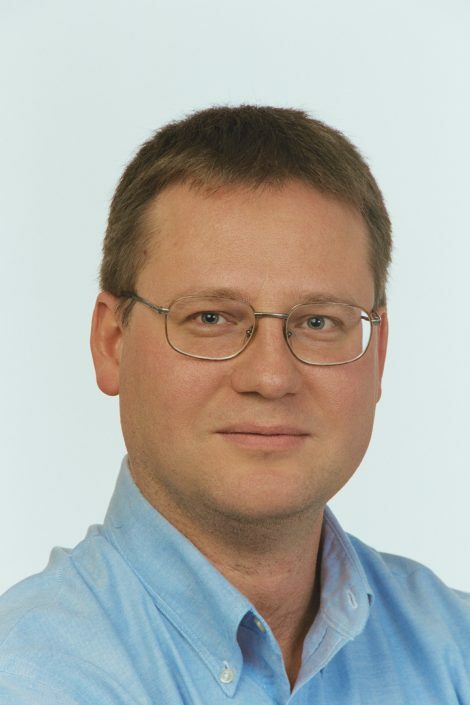 He has taught harpsichord and continuo at the University of Toronto, Wilfred Laurier University in Waterloo, Ontario and at Havergal College, Toronto, and fortepiano at the University of British Columbia. When he is not playing early music, Michael lives with his partner Carolyn Sinclair and Kona, the Abyssinian cat, in Victoria, BC, Canada, and is an avid collector of early jazz and early opera 78 rpm recordings and is an early phonograph/gramophone restorer. Tickets are $150. A tax receipt will be issued for a portion of each ticket. Seating for this special event is limited. 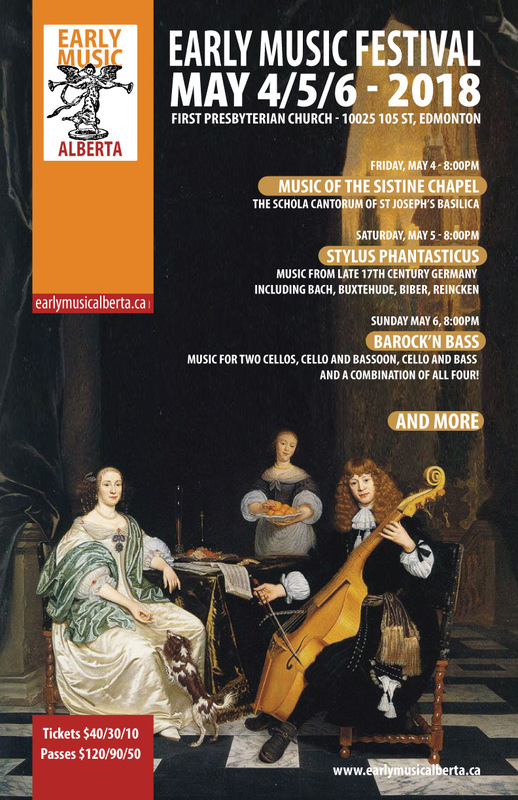 This event is a fundraising concert for Early Music Alberta. Your support is really appreciated! 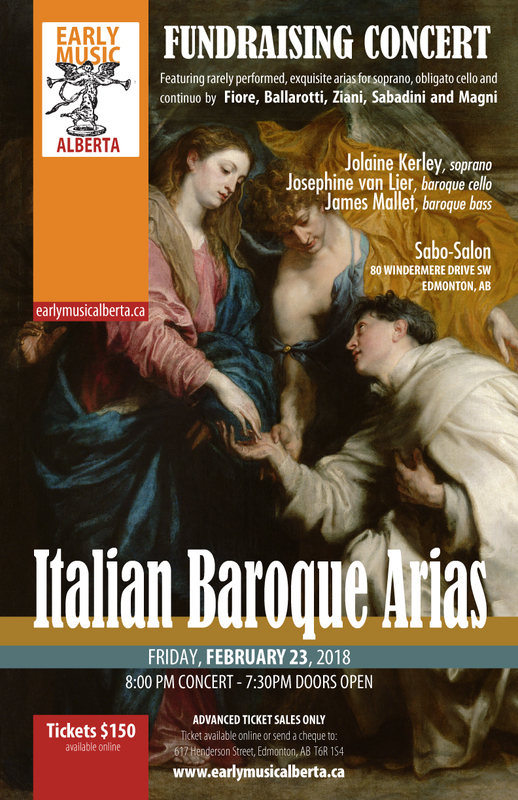 This program features rarely performed, exquisite arias for soprano, obligato cello and continuo by Fiore, Ballarotti, Ziani, Sabadini and Magni. 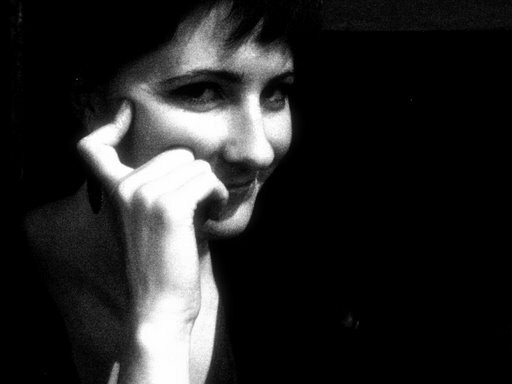 Soprano Jolaine Kerley will move you to tears performing these heartbreakingly beautiful, early Italian arias. Of course the cello played a major role in the continuo of operas, but these composers began to give the instrument some wonderful obligato arias that will be heard on this program. 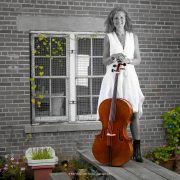 Used as an ‘instrumental’ voice, the cello can animate and extend the ideas put forth in the words and in the soprano’s music. As string makers in Northern Italy invented a way to wind the low strings of the cello with metal (copper or silver), which allowed them to make the strings thinner and the response quicker, many composers started to compose for the cello as a solo instrument. Some works on the program will be these earliest works for cello and continuo by Fiore and some unknown composers. In the 17th and 18th centuries, performances often took place in the intimate setting of a Drawing Room in someone’s home. This year’s fundraising concert will be held in the Sabo-Salon. 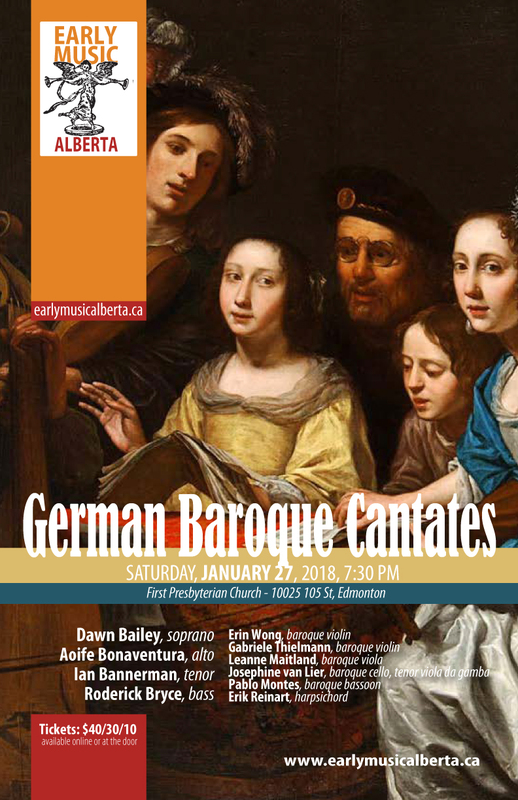 Located in South-West Edmonton, the performance in the Great Chamber of this home will give you the opportunity to have a musical experience much like some of our ancestors would have had during the baroque era. You have the opportunity to be close to the musicians, listening to some of the greatest music ever written, and be in the comfort of a home. You will feel transported to earlier times. The evening also offers a chance to participate in our Adopt-A-Musician program. You can sponsor, in part or completely, the fees or travel cost of musicians performing during the festival. You could also sponsor an entire concert. Every little bit helps! Our Adopt-A-Musician program is available online also. We will issue a tax receipt for every donation. Do you collect airline points or AirMiles which you would like to donate? 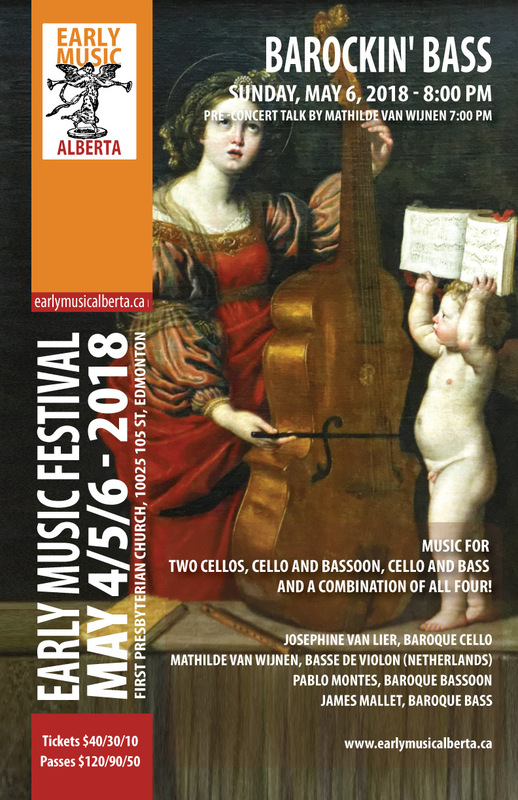 Our Dutch guest for the May 2018 Festival, Mathilde van Wijnen will be travelling with a Basse de Violon to Edmonton and will need two seats: one for her and one for her “over-sized-cello”! Curious? Please visit our website, or contact me personally for more information! Looking for a Christmas gift? Why not give Fundraising Concert Ticket to that special person in your life? The beautiful sanctuary of the historic First Presbyterian Church in Edmonton will be the stage where a stunning lineup of some of Alberta’s finest baroque musicians will perform cantatas and instrumental music by Bach, Graupner, Telemann, and Handel. This is a concert not to be missed! The cantata, or sacred concerto (as Bach probably would have called his early cantatas), is a style of vocal music for individual or group of solo voices with instruments, and a style favoured by Schütz and Buxtehude that was very popular especially in Germany in the 18th century. 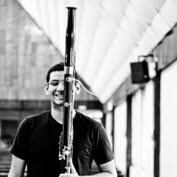 Michele Carreca was born in Foggia and graduated in lute at “Conservatorio Santa Cecilia” in Rome with Andrea Damiani in 2006. He attended master classes held by Paul O’Dette and in particular by Hopkinson Smith, wich has been a main point of reference for his studies. 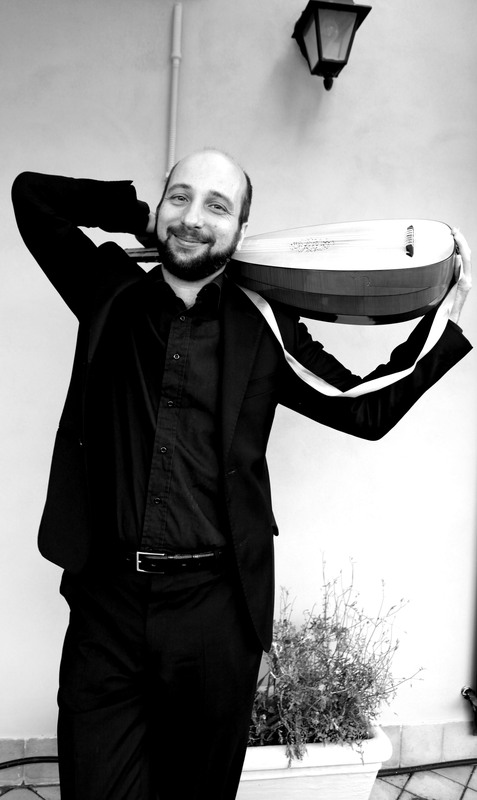 As a soloist and as chamber musician Michele Carreca has played for Gesellscahft der Musikfreunde in Wien in the Musikverein Wien, Brahms Saal, “I Concerti del Quirinale di Radio 3” (Rome), “La Stanza della Musica” and “Piazza Verdi” (Rai Radio 3), “Stockholm Early Music Festival” (Sweden), “Festiwal Muzyki Dawnej” Jarosław (Poland), “Festivalul Baroc” Timisoara (Romania), “Festival Camino de Santiago” (Spain), Istituto Italiano di Cultura New York City (United States), Festival “Musique et Memoire” (France), the Staedel Museum in Frankfurt (Germany), the Alte Pinakothek in Munich (Germany), the Italian Cultural Institute in Munich (Germany), Herzog Anton Ulrich Museum Braunschweig (Germany), Festival Antiqva, Barcelona (Spain), the Juan March Foundation in Madrid (Spain), for the National Gallery in London (Great Britain), “Festival international de musique andalouse et des musiques anciennes” in Algiers, (Algeria) “Mostra Internacional de Musica Antigua” in Curitiba, Brazil, for Universidade Federal in Rio de Janeiro (Brazil), for the European Early Music Day of Rema, in Uzghorod (Ucrain), “Festival der Laute” in Dresden (Germany), “Nuove Settimane Barocche” in Brescia, “Urbino Musica Antica”, “Accademia Filarmonica Romana” in Rome, “World Bach-Fest” in Florence, “Echi Lontani” Festival in Cagliari, “Segni Barocchi” in Perugia, the concert season of “Centro di Musica Antica Pietà dei Turchini” in Naples, “Musica ai Frari” in Venice, etc. In Baroque operas and orchestras he played under the direction of John Eliot Gardiner, Andrea Marcon, Alessandro De Marchi, Chiara Banchini, among others. 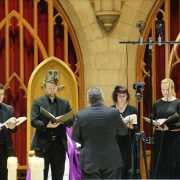 He has made recordings both as a soloist and as a continuo performer for BrilliantClassics, Classic Voice-Antiqua, Ipsar, Rai Trade, Urania Records, Continuo Records. He has given master classes and concert-lessons for numerous institutions, such as Conservatorio di Foggia, Conservatorio di Pescara, Dams Univeristà Roma Tre, Universidade Federal do Estado do Rio de Janeiro. 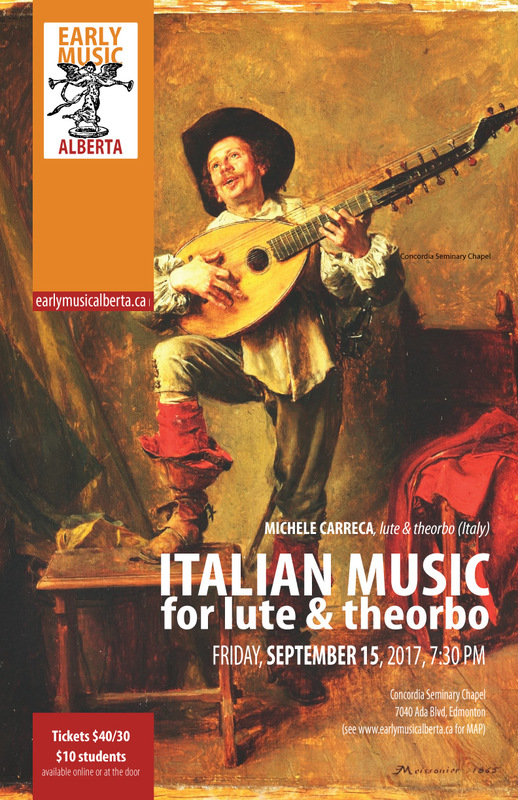 Michele Carreca lives in Rome and is Professor of Lute and early plucked instruments at the Conservatory V.Bellini, Palermo. His last recording works available in 2017 are “Henriette the Princess of the Viol” with Maddalena Del Gobbo viola da gamba, for Deutsche Grammophon, and “Giacomo Gorzanis : Solo lute music” as a soloist for Deutsche Harmonia Mundi. This album is the first monography dedicated to Gorzanis, a famous Renaissance lutenist and composer born in Apulia.